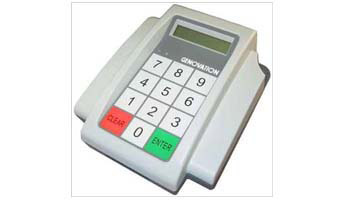 The Genovation MiniTerm 905 is a fully programmable LCD mini-terminal. and supports simple and complex re-programmable key macros and system configurations. Includes detachable serial (RS232) and USB cables for easy setup and different applications. It also has multiple internal device options for fast and easy data transactions. Please call 800-459-7931 or 480-813-3100 for information and pricing. Power Supply 5vDC, 60ma (not including card reader). RS232 adapter supplied, USB bus powered. Magnetic Card Reader Mag card swipe reader for ATM, driver's license, credit cards, etc. Located on right hand side. RFID Card/Label/Tag Reader 125kHz or 13.56MHz MiFARE MF1/Ultralight cards, labels and tags. Located on left hand side.